Acclaimed Nigerian-born chef Tunde Wey is exploring issues of race and identity in America through a traveling dinner series called “Blackness in America” that features traditional Nigerian food and a rotating cast of featured guests. 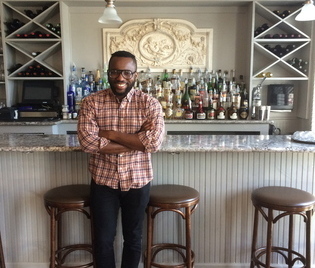 Following stops in New Orleans and Detroit, Seedstock caught up with Wey to discuss his background and what led him to create this unique culinary project that blurs the lines between food service, cultural study, and community forum. That’s a doozy! I’m Nigerian. I moved [to Detroit] when I was 16… lived in Detroit and lived in the suburbs around Detroit and moved back in the city in 2011. I lived in Woodbridge and Highland Park for about 20 seconds and in Southwest Detroit. Professionally, I guess everything up until 2013 was me writing and doing whatever I had to do. In 2014, I opened up a restaurant with my partner at the time Peter Dalinowski in Hamtramck, and in the fall of 2014 I left the city to travel to cook, and in 2015 I opened up a place in New Orleans. It was part of a larger food hall. I left in the summer of 2015 because I wanted to open up my own independent space, my own restaurant. I travelled to a couple of cities to cook, and came back to New Orleans and tried to figure out what I wanted to do. A couple of buildings I was looking at fell through, so I had to regroup and then that’s when I started “Blackness in America,” in March. What informs your cooking style? From where do you draw inspiration? I’m Nigerian, so the food I cook is Nigerian. I draw from my heritage and I don’t know if I’m even drawing from it, it’s just food I grew up eating and I’m approximating it in the kitchen for other folks. I started cooking Nigerian food because in opening up (revolver) [we were] serving mostly modern American food–not even necessarily high-end, but it was influenced by finer dining service and preparation style. So, just the way people approach and respond to food and what that said about food values, if you will, just started prompting me to create this oppositional food language. I think people obsessing over case profiling and that sort of stuff, it sort of made me uncomfortable and I wanted to show people a way of eating and a style of food that was different than what they were used to. It was in reaction to how people currently engage with food, which I think can be too abstract. When did you conceive of the idea for the “Blackness in America” dinner series? There wasn’t any singular moment that created the series. I think the conception of the series was maybe six years or seven years ago, even maybe when I moved to this country. There were so many experiences that built on each other up until now. It was something that was percolating–it wasn’t really organic, it was concerted, and I had to think about what I was doing, and I had to think about the approach. In doing it I was reacting to how I felt and responding in that way, but there was also an intentionality in what I was studying, researching, who I was talking to, and how I was crafting the series. Tell me about the themes of “Blackness in America” dinners and how your guests have responded. The theme is Blackness in general, and then the direction of where the conversations go are in part led by my prompts, which are offered to a special guest I’ll have at each dinner. I’m having this conversation with the guest in communion with the diners, and then the conversation extends beyond the guest and myself and expands to the diners who are also able to respond. So based on the questions I ask and the general disposition and general mood of the room, we follow a certain path. So it’s broadly about Blackness, and then certain questions that are asked, and some questions have more legs than others. There’s no specific theme we discuss. So the featured guest changes for each dinner? Yes, so far that’s been the format. Everybody who is talking about Blackness is Black. In New Orleans, the guest was a filmmaker…who doesn’t necessarily do “Black films,” but the question of identity is strong in his work. Another guest was an educator who works in tertiary in middle and high school public education. Another was a couple, who both work in the nonprofit sector: the woman was a scholar, runs a nonprofit and does contract work with Black organizations and the man works in reproductive health. The last guest in the New Orleans dinner series was a food activist who runs a nonprofit and is devoted to equitable commercial development in communities. In Detroit the guests were Aaron Foley, who is a writer and editor of Blac Detroit Magazine and then Tiff Massey, who is an artist. In Boston, I’ll have a Nigerian-American who is a performance artist, and in Austin it will probably be a college professor. Having these conversations about race in America is important, but have you thought about tackling other social issues in the future? Yeah, so personally, I have more interests than just singularly talking about Blackness, and part of that is to reiterate that Black commentary isn’t restricted to Black issues. So the plan is to eventually discuss other topics like patriarchy, sexual violence towards women, immigration, the politics of sexual identity, capitalism, and things like that. What cities have you already visited, and where are you heading next? I visited New Orleans first, that’s where it started, it’s where I live. Then I went to Detroit, and next I’m going to Austin and Boston, and maybe New York, maybe Rhode Island. Will you take the “Blackness in America” series to every state? No, I definitely don’t think that will happen. Ain’t nobody got time for that. I’m just going to keep doing dinners and the plan is to eventually open my own space, so I’m working towards that always.